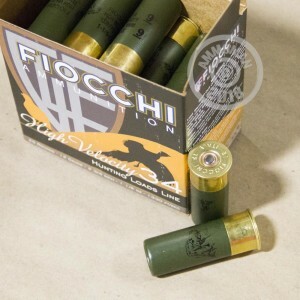 This Fiocchi shotshell ammunition is a reliable and inexpensive general purpose sporting load for 12 gauge shotguns. 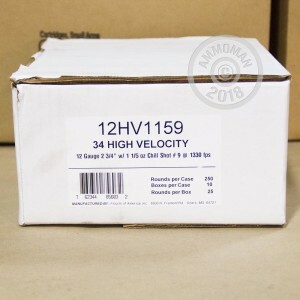 Packaged in boxes of 25, these shells achieve a high velocity of 1,330 feet per second and distribute the 1 1/5 ounce load of #9 shot efficiently for maximum impact against various types of small birds. 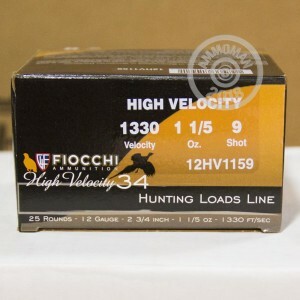 Fiocchi shotgun ammo sold in the US is almost exclusively loaded in the US as well, at Fiocchi of America's plant in Ozark, Missouri. The company produces a wide variety of excellent shotshell loads including self-defense and hunting buckshot, steel waterfowl, and birdshot ammo. Check them out at AmmoMan.com and feel free to mix and match; all orders totaling over $99 ship at no additional charge!